This program provides interactive computer animations and simulations for teaching basic neurophysiology. 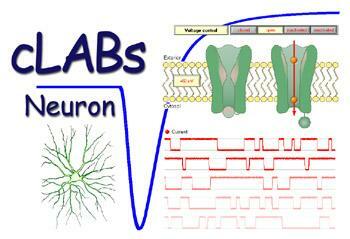 To facilitate independent student work, cLabs-Neuron is split into several applications. It introduces passive and active membrane properties and their electrical equivalents, and illustrates gating mechanisms of different types of ion channels. Relatively simple experiments can be done, for example with RC (resistor-capacitor) circuits or variable ‘ionic’ conductances. More complex laboratories are provided to examine voltage-dependent single-channel currents and to see them summing-up to whole-cell currents. Holding and command voltages as well as several neuron parameters (e.g. ionic concentrations) can be changed, and ion channel blockers (TTX, TEA) can be applied. The same can be done in a voltage-/current-clamp laboratory to examine the relationships between ionic kinetics and action potential generation on different types of neurons which are simulated with Hodgkin-Huxley (HH) type algorithms. Advanced students can make use of a ‘neuron-editor’ to change the neuron’s parameters in order to attain specific dynamic properties.